Search Engine Optimization is an internet marketing term used to describe procedures and techniques, when used properly, that can increase your visibility in search engine results (SERPS). Obviously, not every web site or page on it can be returned as the #1 or #2 search result in Google, but a lot can be done to the structure, coding and content of a site to make it more highly visible in a search result. The best optimization plans usually involve a combination of these two approaches. My specialty is organic optimization, which simply means I will utilize a variety of options to have your web site appear as close to the top of the organic, or non sponsored (paid-for) search engine results. Of course, the implementation of these and a host of many other SEO approaches are totally dependent on your business goals and the state of your current site, provided you have one. 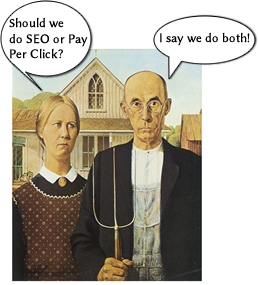 “Most businesses understand the importance of implementing SEO tactics into their overall marketing strategy. However, many executives still think that there is a one size fits all SEO program, and by simply copying the same methods as their competitors they will see an instant improvement in their companies’ search rankings. Contact Me for more information about SEO Services!